It feels like several people in my life have felt or been stuck this week. Everyone seems to be trying to make decisions about work, daycare for their kids, hospital care for their parents, etc. At work, my colleagues and I are spending a ridiculous amount of time trying to do planning for 2017 and the decisions and trade offs are not coming easily. 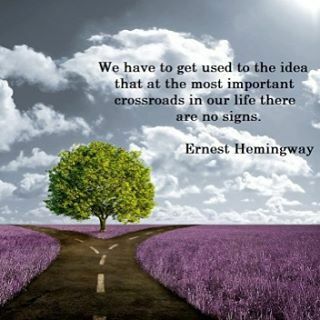 For me personally I feel like I’m approaching a crossroad…I’m not at it yet…but I’m on the walk towards it. Like so many of you, I have some choices to make over the next few months that might influence how the next few years go. There are some things I need to finally give up on and move past. And there are some things that I need to be willing to try and give some energy to. Either way…choices must be made.